I have written about many different types of compost piles in the garden and I wanted to take some time to write about the way I made compost for my garden when my job kept me from home most of the days of the week. Your preparations for the organic garden do not have to cost you a lot of time. One excellent way to save time and build great soil for your garden is to compost directly into the vegetable garden. This requires that you expect to have a fallow season for at least some part of your garden. Many South Florida gardeners do put their beds to rest when the rainy season starts, so this will probably work great for you. The beauty of this backwards planting season (growing in the winter, fallow in the summer) for us is that while our summer is so extremely hot and wet that our bedding plants will rot it is perfect weather for the fastest compost possible. Here’s what you do. It is June, and it rains everyday here now, and when the rain stops and the sun comes out it is sauna hot and humid. This is the ultimate time to prepare your garden for the next growing season. Cut down what’s left of your garden vegetables. I move their carcasses out of the garden to another compost pile for weeds and finished garden vegetables. Some people will cut them down and drop them where they fall in the garden. I think that’s ok if they were healthy, and nematode free, and if you are willing to cut the stems as small as one inch long pieces. Remember, this is going to be a fast compost pile and we are expecting it to consume pathogens and weed seeds present in the things we drop there. Pull any weeds that have started there and begin covering the garden up with vegetable kitchen scraps, including coffee, tea, and most anything but meat, bones and grease. Make layers of greens and browns just like we do for other types of compost piles. 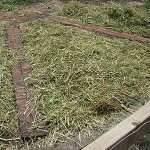 Continue covering with shredded brown leaves, manures, grass clippings, sawdust, bedding materials from your pets (hamster, guinea pig, rabbits, horse), shredded newspaper, and when you have a big pile up cover it all over with straw which should be loosened from its compressed bale state. If it isn’t raining already hose it down. This should look like a huge mound maybe as much as 18″ to 20″ high. It is going to shrink as it breaks down, and in a few months when it is time to plant you shouldn’t be able to find much more than dark soil there beneath the straw, and it will have shrunk to nearly half it’s size. At planting time you should be able to plant right into what’s left of the mound without even moving the straw which will act as garden mulch for the new crops. Remember your ratios for nitrogen to carbon. To make it simple I say you should have about 4 or 5 times more carbonaceous material than nitrogen heavy materials. It can be more complicated than that, but it need not be, and the more often you do this the simpler it will seem to get the balance down right. 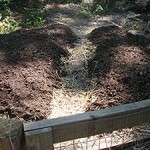 Two things I do not do with the Direct to Garden Composting method are: Turn the compost. I suppose you can if you want to, but I never have, and although I used to turn it once into the soil right before planting I don’t even do that anymore. The compost piles I do turn are many feet deep. This mound will be 12 to 18″ high when you finish putting the straw on top. When you water it down its height will diminish an inch or two more. The other thing I don’t do is step into these garden beds. I want them tall and fluffy and uncompressed. You will too so make sure they are not too wide to do all of your work from the outsides of the gardens. This method is nearly the same as making the no dig garden box that I wrote about last summer. 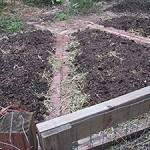 You can even use the no dig garden box recipe on top of your fallow on the ground vegetable garden. Forget about tilling or turning the soil, you won’t need to do it, and the worms will thank you for not disturbing their tunnels by adding tilth and vigor to your vegetable garden soil. The pictures below are of my on the ground garden getting the lasagne layers treatment just before the winter planting season started last fall. Using the no dig box garden lasagna recipe allowed me to plant right into the layers a week after putting them down, and that was just a couple weeks after removing a pumpkin vine that had grown there all summer. The trick is the 4″ of compost on the top. The straw layer below the compost brings lots of air to the manure layers, and the alfalfa on the bottom breaks down quickly adding a nitrogen boost at the bottom for full season vigor. With a long wet summer coming you can forgo the compost on the top. 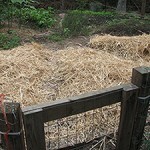 You will find the compost below the straw when you push your fingers in there in the fall. One more thing about the the direct garden compost method. I covered over some garden beds in October of 2005 a few days before category 2 hurricane Wilma came ashore. That storm took trees down, on my property (and that was a year after 2 hurricanes had already pruned my property), but didn’t move my mound or the straw I laid on top of the garden. This is a good fast, non eroding, and effective way to fix your garden soil.